Nintendo took the crown last week for pre-Christmas console sales in Japan, with sales of Wiis and DS Lites higher than all the others combined. 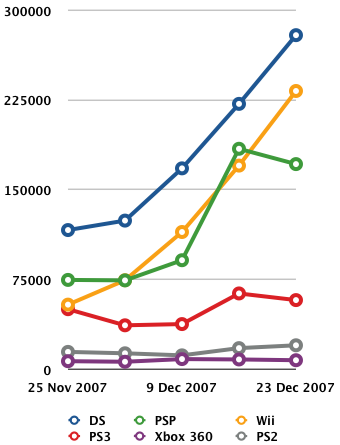 The DS Lite topped the chart – again – with unit shipments totalling 279,551 consoles for the week to 23 December 2007, according to Japan’s Media Create organisation. As you can see from the chart below, the console’s week-on-week sales growth continues unabated.